A private prescription is like any other prescription for medication written by a doctor, except that private prescriptions are not funded by the NHS. Private prescriptions are written by doctors in private practice, and by NHS doctors for medication which the NHS will not fund. The NHS does not fund travel medication, such as malaria tablets, and restricts quantities of some other medicines. The NHS will fund only a small supply of the most popular drugs used to treat male impotence. Doctors usually charge patients for writing private prescriptions. Even doctors working in the NHS are entitled to charge their patients a fee for writing private prescriptions. The British Medical Association (BMA) recommended in 2009 a fee of £15.50 per prescription for private practice, although doctors are free to charge less, or waive the fee, and can charge considerably more. All doctors can write a private prescription, although for doctors seeing their NHS patients, some restrictions apply. The NHS does not fund the cost of medicine dispensed from private prescriptions. Patients pay the cost of the medicine dispensed on private prescriptions. The cost can vary greatly, because like the fee for writing a private prescription, there is no fixed price for medicine dispensed privately. Pharmacies compete with each other on price when they supply medication on private prescriptions. In practice the mark up over wholesale prices for privately dispense medicine varies. The mark up for the most popular impotence treatments is often as high as 100% or more. Private prescriptions for a range of medications are now widely available in the UK online. The prescriptions are issued electronically via online clinic websites. General Medical Council (GMC) registered doctors working in Care Quality Commission (CQC) registered practices carry out online consultations. The private prescriptions which arise from these consultations are sent automatically to NHS dispensing pharmacies. Patients usually pay a single fee for the consultation, prescription and the medication. The medication is posted registered delivery from General Pharmaceutical Council (GPhC) pharmacies. These services suffer from being associated in the public mind with illegal overseas pharmacies which supply all sorts of medication, some of it fake, without checking and without concern for the addictive and dangerous nature of some of their supplies. Patients use regulated online clinic services fairly widely in the UK, although these services remain little understood by many doctors and others in the healthcare sector. Patients using these online services may be unaware their medication is supplied by private prescription. Surprisingly some online services, rather than as one would expect, are not low cost, although Dr Fox breaks with the tradition of huge price mark ups (see medicine prices and compare medicine prices). What medicine can be prescribed privately? 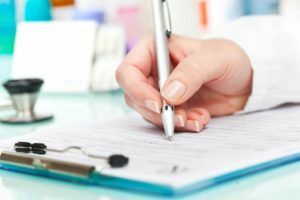 The most widely written private prescriptions, certainly online, are for the erectile dysfunction drugs (Viagra/sildenafil, Cialis, and Levitra), hair loss treatments (Propecia/finasteride 1mg), smoking cessation drugs (Varenicline – Champix) and travel medication, particularly the expensive and widely recommended drug Malarone. Some medicines which are also available through pharmacies without a prescription can actually be cheaper on a private prescription purchased online. This includes some hay fever treatments and dry skin treatments. Typically private prescriptions are written for medicines which are not readily available through the NHS, although any medicine with a UK license can be supplied in this way. Patients who are not eligible for NHS treatment may need to access all their healthcare privately at considerable cost. Most people are familiar with standard green NHS prescriptions written and signed by doctors. These are the prescriptions GPs use for almost all medicine provided through the NHS. Doctors in the NHS do not charge for writing these prescriptions. In England there is a standard prescription fee of £8.40 (December 2016) for each item. This fee is paid to pharmacies at the time medicine is dispensed, although it is said that 90% of people are exempt from these charges. In Scotland, Wales, or Northern Ireland there is no NHS prescription fee. Posted on April 24, 2012 December 1, 2016 by Dr Tony Steele in Cost of medicine, Health News, Online clinic.